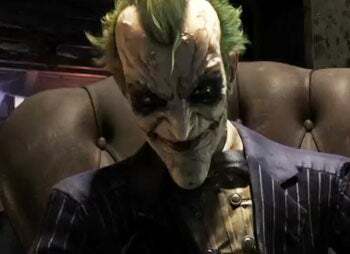 Here's what we know so far: Rocksteady's fresh-announced Batman Arkham Asylum sequel probably won't be called Batman Arkham Asylum 2. The first one--actually the second best superhero game yet made, tailing Irrational's still-sterling Freedom Force--already plumbed the dilapidated depths and improbably gothic heights of DC's version of Guantanamo for the super fruity-loopy. Locking Batman in twice would be like putting Jeff Goldblum and Richard Attenborough back in the vicinity of Isla Nublar after they helicoptered away from InGen in 1993. Fear not, the teaser trailer should mitigate any milieu-related concerns. So yeah, it'll be set in Gotham large, though I wouldn't hold my breath for Grand Theft Batmobile. Rocksteady has no experience doing open-world games, nor, I'd wager, a development budget to rival Rockstar's (over $100 million lavished on Grand Theft Auto IV alone). Expect something more in keeping with Arkham's tightly regulated gameplay, a mishmash of architectonic scrabbling and Metroid Prime indebted scan-visor sleuthing, punctuated by occasional swathes of open-airy grappling and swooping. Batman has a trove of gadgets and gizmos, enough for a dozen sequels at least, so I'd expect we'll see a fairly conservative "don't-change-what-ain't-broke" approach, and I can't see anyone really complaining. For the record, publisher Warner Bros. refers to it as "the sequel to Batman: Arkham Asylum," and confirms it's in development already, so I'd bank on a late 2010 release (though the lack of anything concrete out of the gate tell me they'll hedge for awhile yet, just in case). The boilerplate publisher and developer press blurbs summed up: "We really-really-really love Batman and promise the sequel will be all kinds of awesome fanboy sauce!!!" Have a look at www.arkhamhasmoved.com, the game's official site, for teaser shots, or to sign up for future updates.